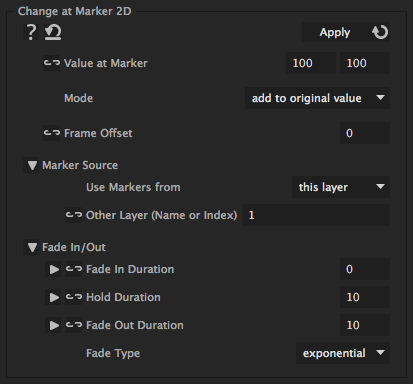 With this iExpression you can modify 2D properies (like the position or scale of 2D layers) at markers. At each marker you can either replace the keyframed value by another value or add something to the keyframed value. The changes at the markers can be faded it and out. Also, you can annotate comments like "50%" to individual markers, to decreate or increase the impact of this particular marker.